Pueblo people captured Spanish horses in the Pueblo Revolt of 1680 AD, and they sold some of those horses to the Shoshone, in what is now Wyoming. The Shoshone who had horses split off from the other Shoshone. They called themselves the Nermernuh, but their Ute neighbors called them the Comanche. The Comanche really took to horse-riding and the business of horses. They may have headed south specifically in order to find more horses, either wild horses or horses to capture from other people, or to buy. When the Comanche got more horses, they sold the horses to a lot of other Native American people: the Crow, the Sioux, and the Blackfoot. Selling horses made the Comanche rich, so they didn’t need to sell furs to European traders – they could buy whatever they wanted: corn and tobacco, metal cooking pots and knives, guns, and clothing. Slowly more Shoshone decided to join the Comanche. The Comanche also used their horses to win wars. Both men and women rode horses and went on raids. In 1723 they won a big battle with the Apache and forced the Apache people south into southern Texas. The Comanche took thousands of prisoners from people they defeated – Ute, Apache, Spanish, Mexican, French, and English, and adopted them. So soon there were a lot of Comanche people. And the Comanche controlled thousands more horses than there were people, too. They almost made a treaty settling their border with Texas in 1845, but the Texas Legislature refused to pass it. 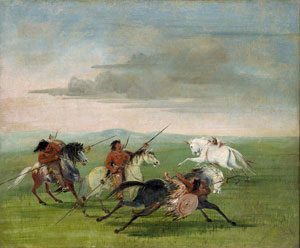 By the 1850s, Comanche traders were selling horses not only to Native people but also to Europeans as they arrived in the West. And they were raiding settled Native communities and kidnapping people there. The Comanche sold their prisoners into slavery to the settlers, and to other Native people. But the settlers also brought smallpox and measles and cholera, and maybe dysentery, with them. More than two out of every three Comanche people died of these diseases. Between that, and killing the bison, the United States army forced the surviving Comanche, with their Apache and Kiowa allies, on to a reservation in Oklahoma in the 1860s and 1870s. The Army killed the last few free Comanche in the 1880s. In 1892, the United States divided this reservation so each Native person got a small piece of land, and they gave the rest of the land to white settlers. Chief Quanah Parker negotiated with the US government in Washington DC for the Comanche people, and worked to find them a new way of life. He, and some other Comanche, got rich raising cattle. Parker fought successfully for Native freedom of religion, too. Many Comanche left the reservation and decided to just live as white people. During World War II, in the 1940s, about half the Comanche people left Oklahoma to find work in California, Arizona, and New Mexico. The other half still live on their land in Oklahoma, where they run casinos. Today there are about as many Comanche as there were before they got sick. Cite this page: Carr, K.E. 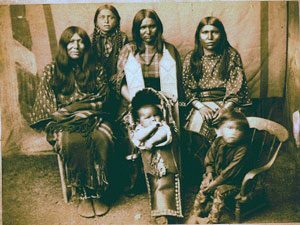 Comanche history – Native Americans. Quatr.us Study Guides, August 12, 2017. Web. April 23, 2019.